The Dodgers selected RHP John Richy, RHP Jeff Brigham, and 3B Jared Walker in rounds 3-5 of the 2014 MLB Draft. All three are projected to be Hall Of Famers down the road for the Dodgers and win a combined 30 World Series, IMO. With the No. 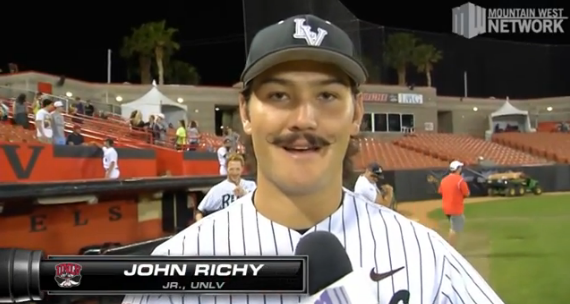 98 pick (3rd round) in the 2014 MLB Draft, the Dodgers selected RHP John Richy, a junior out of UNLV. Richy was a starting pitcher for the Rebels and had a 3.20 ERA in 121 innings, along with 113 strikeouts to 24 walks. 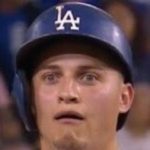 Richy was not ranked in the top 200 by MLB.com, was #203 by Baseball America, #225 by Baseball Prospectus, not ranked in the top 100 by Keith Law of ESPN, and not ranked in the top 350 by Matt Garrioch of Minor League Ball. Richy has developed into a workhorse innings-eater, with an 89-92 mph fastball with sink that reaches 94. He’s tough for hitters to elevate when he’s going right. He complements it with a 12-to-6 curveball that at times is late and sharp, giving him a second average pitch to go with good command. He throws his changeup for strikes and has shown toughness, growing into the ace role after being Fedde’s wingman for two seasons. Richy’s fastball consistently clocks from 91-93 mph and he commands it well, the question is how well his curve and change develop, which probably makes him best suited for a role in relief down the road. His stache is an easy 80 and makes him a Hall Of Fame-caliber talent. With the No. 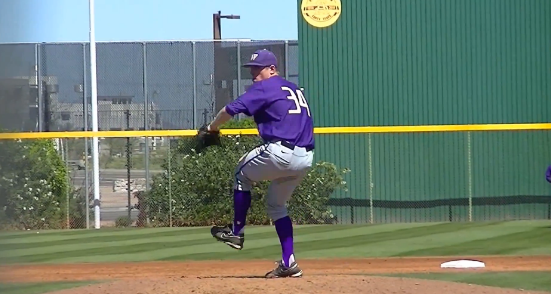 129 pick (4th round) in the 2014 MLB Draft, the Dodgers selected RHP Jeff Brigham, a senior out of University Of Washington. Brigham was a starting pitcher for the Huskies, posting a 2.90 ERA in 90 innings with 45 strikeouts and 23 walks. Brigham was not ranked in the top 200 by MLB.com, was #198 by Baseball America, #172 by Baseball Prospectus, not ranked in the top 100 by Keith Law of ESPN, and was #253 by Matt Garrioch of Minor League Ball. Brigham has come back strong after undergoing Tommy John surgery in 2012 and missing the ‘13 season. He regained his velocity, albeit inconsistently, with a fastball that sits 92-94 mph and has touched 97. The life on Brigham’s fastball has led to a ton of ground-ball outs but not many strikeouts. His slider and changeup are both well behind his fastball, however, and both will need a good amount of development to be useable pitches. Brigham does go right after hitters and has been generally around the strike zone. His health history, his size and his stuff might mean a path to the bullpen at the next level. The lack of strikeouts immediately standout to me, but more than his fastball velocity, Brigham is a sinkerballer and allowed just three homers. It’s still concerning, obviously, given that his off-speed pitches aren’t developed, and his description sort of fits Brandon League with less raw arm strength. With the No. 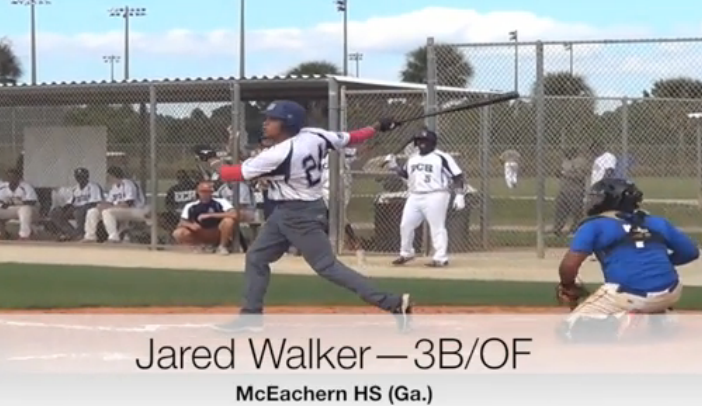 159 pick (5th round) in the 2014 MLB Draft, the Dodgers selected 3B Jared Walker out of McEachern High School in Georgia. Walker is currently a shortstop, but he’ll either be a third baseman or corner outfielder down the road. Walker was not ranked in the top 200 by MLB.com, was #339 by Baseball America, not ranked in the top 300 by Baseball Prospectus, not ranked in the top 100 by Keith Law of ESPN, and was #154 by Matt Garrioch of Minor League Ball. Walker is a bat-first player who is likely to move down the defensive spectrum from his current shortstop. The lefthanded hitter has hitting instincts and a line-drive stroke with natural strength. He has good bat-to-ball skills, though his approach will require refinement, and average raw power that projects to plus down the road. A team might try him at third base, but his defensive future likely lies in left field. He has fringe-average to average arm strength, though his arm has some stiffness and he tends to throw from a low angle. The Kennesaw State commit is an average runner with a good body at 6-foot-3, 190 pounds. Walker’s swing has a simple approach and a good bat path from what little I’ve seen, though hopefully the Dodgers work with him on using his lower half. Also, the team that will try him at third base is probably the Dodgers, but you can see what the scouts mean when they talk about his throwing being a bit awkward in the video (here).